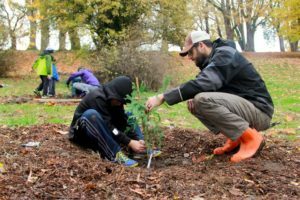 The ten saplings are only about 18 inches high now, yet they are genetically identical to some of the largest and oldest coast redwoods on earth. 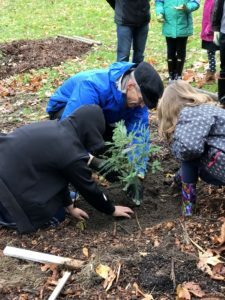 They were planted in Laurelhurst Park as part of an effort to expand the presence of coast redwoods in the Seattle area. 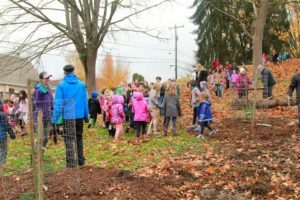 Laurelhurst Elementary School students from three kindergartens and three third grade classes planted the trees on Nov 17, 2017. 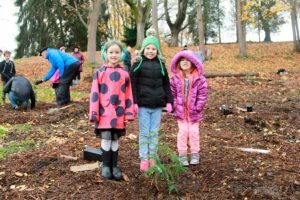 Seattle received these saplings through the project Moving the Giants to Puget Sound, which has delivered more than 300 of the redwoods to 30 Puget Sound communities. The main goal of the project is to preserve the genetics of champion redwood trees for future generations as well as to expand their range north. It’s also preserving the experience of stepping into a redwood grove, which is akin to walking into Nature’s Cathedral. 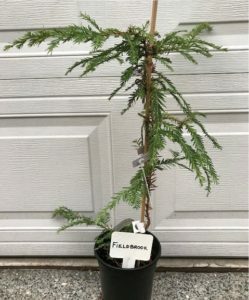 These cloned redwood saplings are in Seattle thanks to the ground-breaking work of Archangel Ancient Tree Archive, a Michigan non-profit whose mission is to harvest the genetics of the world’s oldest and largest trees before they are gone and reforest the earth with the offspring of these champion trees. 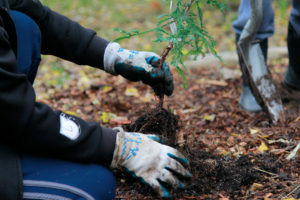 Archangel crews harvest cuttings from the tops of existing redwood trees and stumps and raise those cuttings into saplings ready for planting. Each tree is an exact genetic duplicate of the giant redwood from which it was taken. 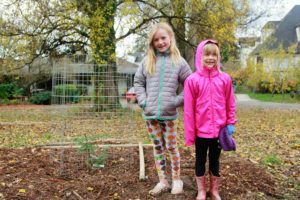 Two of the Laurelhurst saplings came from the Fieldbrook tree, a massive redwood that measured 109 feet around at it base. Although the tree was felled in 1890, it still produces sprouts. 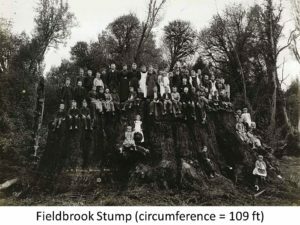 If the Fieldbrook tree were alive today, it would rival the General Sherman tree as the largest tree on earth. 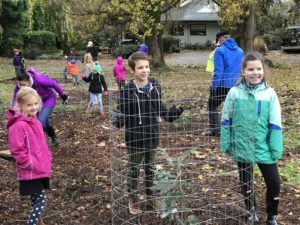 The redwood trees were planted by 24 kindergartners and third graders from Laurelhurst Elementary School, which is just across the street from the park where the trees were planted at the corner of NE 45th St and 45th Ave NE in Seattle. 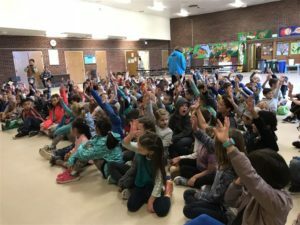 Climate Justice Ambassadors from Plant for the Planet visited the school on Nov 13 to make a presentation to an assembly of kindergartners and third graders. The students were so excited. It was so much fun. 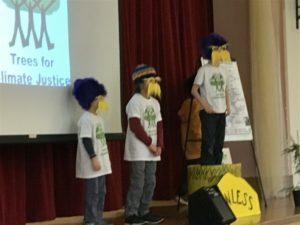 Four Climate Justice Ambassadors from Plant for the Planet play the role of the Lorax from Dr. Seuss. Three kindergarten and three third grade classes from Laurelhurst Elementary respond enthusiastically. 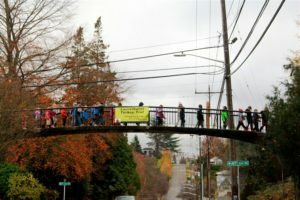 140 school children from three kindergartens and three third grade classes stream across the bridge from Seattle’s Laurelhurst Elementary School to Laurelhurst Park. 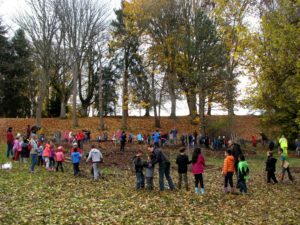 12 children from grades 2-3 team up with 12 kindergarten buddies to plant trees while the other 100+ children have a scavenger hunt. 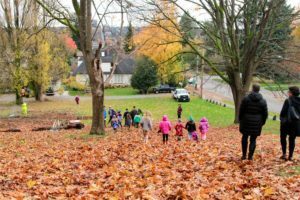 Down the leaf-covered hill come the children to the planting site in Laurelhurst Park. The small redwood giants-to-be are ready for planting. What a perfect Fall day! 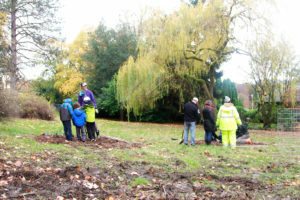 The children have been anticipating this day since learning about the tree planting project a few days earlier. 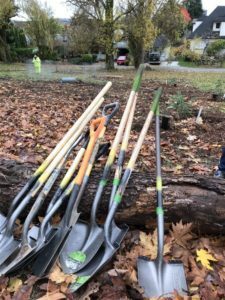 Shovels enough for each group of 2-3 students to plant one of the ten redwood trees. 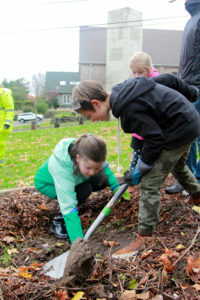 Philip Stielstra, project organizer, gets help from two willing Laurelhurst students to demonstrate how to plant a redwood sapling so that the root crown is level with the surface of the ground. 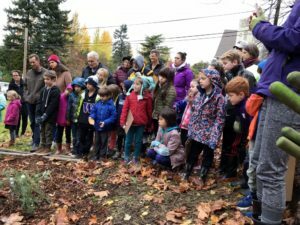 All of the kindergartners and 2nd and 3rd graders are eagerly looking on in preparation to putting those shovels to work to plant their own trees. Ready, set, go! The shovels are soon put to work. 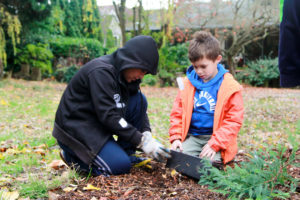 Two Laurelhurst students, together with a volunteer, are busy preparing a home for one of the redwood saplings. Voila! A redwood giant-to-be is in the ground. 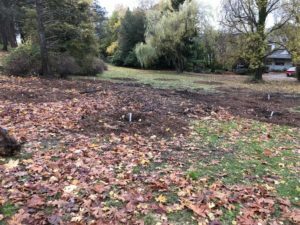 Another hole is being dug by a group of five Laurelhurst students. 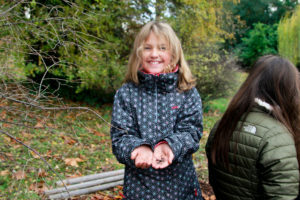 This rich soil is alive with earthworms, as this young student is happy to display. At the far end of this oval-shaped grove two more trees are being planted. 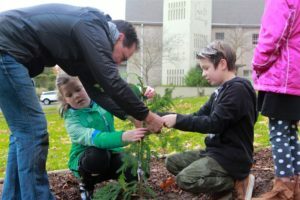 A third-grade student at Laurelhurst Elementary in Seattle helps tie this redwood sapling to its stake with help from Matt Stemple, Seattle Parks arborist. Taking a moment to enjoy a sense of accomplishment and imagine how big this tree will become some day. 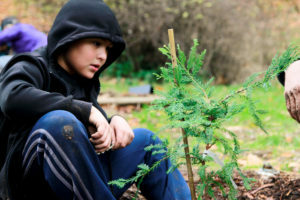 A third-grader and his kindergarten buddy get ready to plant another tree. First let’s remove the tree from its pot so we can see how the roots are doing. The roots are looking pretty good, eagerly awaiting their new home in Laurelhurst Park. 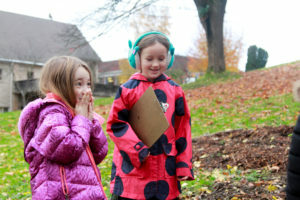 Another pair of Laurelhurst students getting ready to plant a tree. 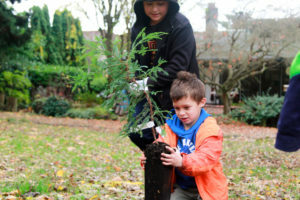 With a happy outcome of one more redwood tree planted. 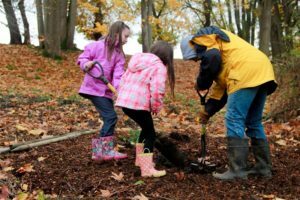 Here’s a tree whose roots are ready to find a home in Laurelhurst Park soil. And now they have, thanks to these willing helpers. One more hole to dig. 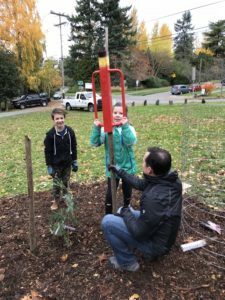 Laurelhurst students stake a tree they just planted, assisted by a helpful parent. And add some fencing to protect this young redwood sapling. Of course posts need to be pounded in to secure the fencing. Then we’re done. 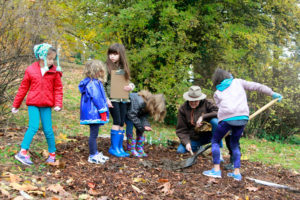 When all ten of the redwood trees are planted and surrounded by protective fencing, the children who were on the scavenger hunt arrive to join the planters to recite a poem in celebration of the new grove of redwoods in Laurelhurst Park. I wish to acknowledge Alexa Stanton for her marvelous video and photographs and also Mary Alison Haskin for her exceptional photographic contributions. A heartfelt thanks to both of them. Archangel Ancient Tree Archive, a Michigan non-profit, provided these redwood trees at no cost to our community. They need our help to continue their groundbreaking work. 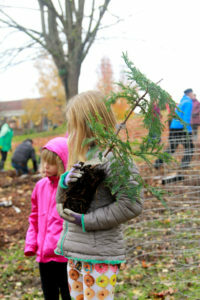 A contribution of $50 helps to create and plant one Coast Redwood. A contribution of any size helps Archangel Ancient Tree Archive carry out its mission of producing and delivering these giant trees to improve the future of our planet. 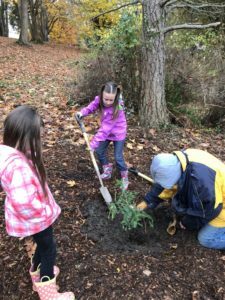 Make a gift by clicking HERE to help Archangel carry out their mission to propagate, archive, and reforest our Earth with the world’s most important trees. Archangel Ancient Tree Archive is an IRS-verified 501(c)(3) non-profit organization. All gifts made are tax-deductible. Wonderful! Great work! It’s exciting and moving to witness the enthusiasm of these kids. This makes me smile with misty eyes- I love it!